Last week saw Scotland host England at Celtic Park in front of almost 50,000 fans. It was a fixture played north of the border for the first time in 15 years, but one which is like no other in international football. In a new series of blogs, The Football History Boys are going to look deeper into the rivalries which make football the sport we all know and love. There is perhaps no place better to start than with England vs Scotland - the oldest fixture in international football and one steeped in political, social and cultural history. From 1872 there has been no shortage of stories in a match which continues to make history to this very day. England vs Scotland of course is not just a fixture which has shaped football history, but one which has encompassed almost every sport. From rugby and the Calcutta Cup to the various sports of the Commonwealth Games, it is a rivalry which has forged national identities, controversy and often political tensions. Just two months ago, the very future of Scotland was in the balance as an independence referendum brought with it new factions and often a nostalgic reflection on past meetings in the wealth of sports each country has fought for superiority in. But here, we are to talk about football and find out just why this fixture is like no other. In keeping with a cliche, let's start at the beginning. From 1870, five representative matches were played between players from both nations - each time in England, with all the 'Scottish' players being based in London. The Scots didn't register a single win, with the general Scottish consensus wanting more 'home-grown' footballers to be involved. Following a number of discussions between the Football Association and Queen's Park FC (Scotland's leading team) a match was arranged, between the latter and a selection of English players, from the various amateur sides of the South. Internationals had already taken place in rugby, and so the next logical step was football. However, what football offered was a spectator sport. Richard Holt, notes that even in the early days of the national rivalry, 'in rugby the atmosphere was friendly, in football it was fanatical'. So what was the first international match like? The Sheffield Daily Telegraph reported on the game, recording an attendance of around 5000 spectators, and making specific notes about the how the game was played by both sides. One key aspect of the early game was dribbling, the ball being given to one player who would rush forward alongside the rest of his team - more reminiscent of a scrum. Indeed early newspaper reports on football often describe scrimmages when discussing tackling. 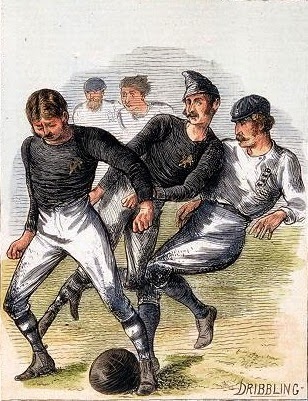 The players were seen sporting different colour caps as part of their footballing uniform, much to the amusement of the crowd, seeing a load of gentleman amateurs running around in odd costumes. The final score was 0-0, surprising when taking in comparison to other scorelines at the time. No goals in 1872, fortunately a result which was to only twice happen again! FOOTBALL. England v. Scotland.— This match was played on Saturday afternoon, at Glasgow, on the of Scotland Cricket Ground at Partick. The weather was fine, and there were upwards of 5,000 visitors upon the ground. Play began about three o'clock, the Scotchmen winning the toss, and the English captain had to kick off, sending the ball well into the lines of the Scotch team, Ottaway and Chenery displaying splendid dribbling. Ends being changed at half time the Englishmen played well, and kept the ball opponents' quarters, but when time was called neither side had obtained a goal, so the match was drawn. Prior to the introduction of the British Home Championships in 1884, the tie was dominated by Scotland. Out of the twelve fixtures between 1872 and 1884 the record read (E-D-S) 2-2-8 in the Scots favour, perhaps in part due to the superior number of 'professionals' in their side. Professionalism had been, for many, a problem within the English game since the 1870s with social divides creating distinct groups within the game along the North/South border. Scottish players had long been prized assets to a number of clubs in England, often making up the majority of squads and being dubbed, 'The Scotch Professors'. Indeed Preston North End's victory in the inaugural Football League season (1888-89) saw a squad with as many Scottish as English teammates. Jimmy Ross, nicknamed 'The Little Demon' scoring 21 goals as football's first 'invincibles' swept aside all before them. The British Home Championships had brought with it a sense of competition lacking from earlier friendlies. Both nations had faced off against Wales and Ireland, but neither game provided the intensity and passion which England vs Scotland could bring with it. As the nineteenth-century reached a climax, the twentieth provided new reasons for resentment between the pair, political disagreement and social divides meant that Scotland and England represented two opposing ideologies. Richard Holt cites the Tory majority at Westminster and its superior power to govern a vastly red nation (at least in the urban areas) meant an 'extraordinary importance' was attached to the fixture. Amazingly, these reasons are still strongly felt today. "Over 2000 tickets were snapped up in an hour when the sale of stand tickets for the Scotland-England Football International at Glasgow on April 2 opened at Hampden Park, Glasgow, yesterday. A queue had waited from ten to twenty-four hours for tickets. A man and his wife, taking turns with each other, waited from 10 'clock on Tuesday morning, but had the mortification of being beaten in the race for the pay-box when the gates opened at o'clock in the morning. From England alone there were three times more applications than there was accommodation, and these were all returned. A lady brought tea and sandwiches for the unemployed who formed up during the wet night in their hundreds, selling their places for 10s to late comers. The Celtic vs Rangers rivalry also lent its hand to the animosity between England and Scotland. From the sectarian issues enveloping Scotland and the Old Firm, supporters from both sides could claim they were the true epitome of 'Scottishness', but a mutual hostility towards England meant, according to Holt, a common loyalty to Scotland was formed. From early on, it was not rare to see the symbols of both nations being presented at opposing grounds, flags, bagpipes and banners were never far away as the annual tradition became one of the most important demonstrations of national identity. "Forget Flodden and remember Stirling Bridge and Bannockburn." Before 1939 and the horrors of the Second World War, attendances at the fixture reached and all time high. In 1937, 149,415 people were recorded at Hampden Park as Scotland defeated the 'auld enemy' by three goals to one. Nine years previous saw a result which was to go down in Scottish folklore - a 5-1 thumping of England at Wembley. The side which were victorious have become known as the 'Wembley Wizards' - Dr Matthew Taylor believes this side (at least for Scottish fans) ranks alongside England's 'Boys of '66', almost receiving mythical status. The home side that were defeated in 1928 were by no means a poor outfit either. Dixie Dean led the line for England in a season which he scored 60 goals for eventual champions Everton - a record which to this day remains in tact. "The Scottish team's victory at Wembley will rank easily as the most emphatic triumph of Scottish style as against the acknowledged combination of speed and craft typical of English football. The Scottish side played like a well oiled machine of perfectly-constructed parts, flung together to a field and immediately welding themselves together into a methodical and compact whole that made the other machine- look rusty, disjointed, and totally inadequate for- its task. It should be emphasised, moreover, that the English team was considered by its moulders the very finest procurable...Alec James' place in Scotland's International teams is now secure for years, for typically a Scottish player in a class not excelled even the good old days." Indeed 1928 reflected the good old days of the Scotch Professors, but following the Second World War it was to be England who dominated the fixture. After 1945 - football went truly global, in the 1950s, the game saw the Magical Magyars, Pele and three World Cups of which England was represented in all and Scotland in 1958. In terms of England vs Scotland it was the British Home Championships which continued to opportunity for battle to once more commence. During the 1950s, the Competition was won by the English (inc. shared titles) on nine occasions with Scotland only registering three triumphs. England's superiority over their rivals was to be at its most evident in 1961 as once more a fixture against the Scots would go down as one of their finest. 5 years prior to World Cup victory, England under the leadership of Walter Winterbottom entertained Scotland at Wembley. It was the final match of the 1961 British Home Championships with both sides in form. Scotland had lost to John Charles' Wales, but thrashed Northern Ireland 5-2 at Hampden two weeks later. England on the other hand had emerged victorious from both fixtures, hitting five past their British rivals. If England's side in 1928, the Scots were no pushovers 33 years later. With stars like Dave Mackay and Dennis Law surely the game would be a tight contest, right? Wrong! The final score - England 9-3 Scotland. In a display of ruthless tenacity, the English forward line, led by Jimmy Greaves tore apart the opposition defence making the scoreline more reminiscent of rugby. "I remember about half a dozen unforgettable games against Scotland but easily the most memorable was the 1961 game when we won 9-3. It was incredible we beat Scotland like that because they had some top players at the time, like Dave Mackay, Denis Law, Davie Wilson and Billy McNeill. But you have to remember that we were scoring a lot of goals...Every time we played Scotland the tension was unbelievable. I first remember playing against them at Hampden Park in 1960 and the crowds there then were about 120,000. When we drove to Hampden the streets were lined with people and it wasn't to wish us happy Christmas. In fact they all seemed to want to show us their wedding-ring fingers!" Following 1961 results were fairly mixed. Of course, England won the World Cup in 1966 but in terms of this fixture, it was the match in 1967 that has gone down as one of its finest encounters. Scotland recorded a 3-2 win at Wembley, making them the 'unofficial champions of the world.' It was quite the turnaround following the events 6 years previous as goalscorers Dennis Law, Bobby Lennox and Jim Malliog were the heroes, with the Tartan Army returning home triumphant. The match itself saw an incredible final 12 minutes as four goals were scored with England never quite managing to score an equalizer. After '67, came a variety of scorelines. In the 1970s the record was (E-D-S) 7-1-3 - England reigning supreme for the most part. However, once more Wembley was stunned, this time in 1977 as Liverpool-bound Kenny Dalglish scored the vital goal to send Scottish fans in to delirium and the English supporters (and crossbar) back down to earth! From 1980, divides between the two nations on the pitch have echoed resentment off it. Thatcher's Tory government did little for the Scottish working class throughout the decade as players from both sides found themselves representing something more than the sport. The unfortunate growth of football hooliganism began to tarnish the fixture and the British Home Championships were also abolished in 1984, bringing the future of England vs Scotland into doubt. However, following a number of ties in the 'Rous Cup' - the match-up once more hit fever pitch in 1996 as the European Championships came to England. The two sides were drawn against each other in the group stage with England once more emerging victorious - winning 2-0 - a certain Paul Gascoigne lifting the roof off Wembley with that goal and that celebration. The modern day has seen the fixture become something of a rarity. External reasons like the threat of violence and the general international fixture pile-up has in some way lessened the meaning of arguably football's greatest rivalry. The Euro 2000 play-off was the last contest with something at stake for both sides. England were the victors in the tie - winning 2-1 on aggeragate before progressing into the Euro Finals only to exit at the group stage. Furthermore, since 1999 only twice have the sides met again, with Roy Hodgson's side running out winners on both occasions; 3-2 and 3-1 respectively. What these last two contests have brought however is a sense that the match-up could potentially become an annual occurrence once more - something few would argue against. So there we have it - the origins, the moments and the future of the greatest rivalry in international football & quite possibly in the entire sport. England vs. Scotland is a fixture that goes beyond the 90 minutes, it represents national identities, social divides and even political landscapes. From the Wembley Wizards to Gazza's genius - this truly is a tie like no other. Is there any better fixture to epitomize the importance of football history? We think not!